Body Politics: Deconstructing the Male Gaze in the Visual, Literary and Performative Arts is an evening of Salon Conversation followed by Lavani Performance that deconstruct the subject of the male gaze, using the enduring, but contestable, legacy of Raja Ravi Varma as a starting point in a vigorous debate about the construction of gender identities in the visual, literary and performing arts. Art critic and author Rosalyn D’Mello and Artist & Bellevue Salons Curator Sharmistha Ray engage in a candid discussion about body politics, the pleasure of looking and gender representation in the visual and literary arts. The evening will conclude with Sangeet Bari, a Lavani song and dance performance by traditional Lavani performers Sunita Dhondraikar and Sangeet Natak Akademi awardee Shakuntalabai Nagarkar. This traditional, folk style from Maharashtra which was originally intended for a wealthy male clientele, is well-known for its boldly suggestive lyrics and body movements. This original set, written by Bhushan Korgaonkar with direction by Savitri Medhatul, seeks to reclaim the expression of female sexuality to open up contemporary ways of engaging with this genre of performance. This event is a part of a series of live public events put together connecting the late 19th-century Indian artist Raja Ravi Varma and his legacy, both celebratory and controversial. The series seeks to explore the impact of the artist’s legacy – his use of mythology, narrative and the idealised female form – in contemporary times. The exhibition is on view from 22 February 2016 till 30 April 2016. 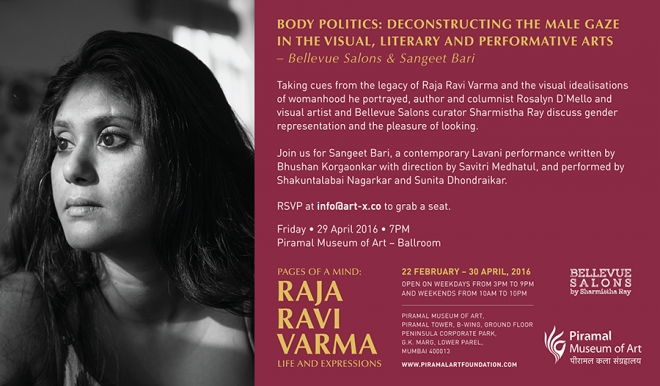 The evening will feature a salon conversation Body Politics between Art Critic and Author Rosalyn D’Mello & Artist and Bellevue Salons Curator Sharmistha Ray on body politics, the pleasure of looking and gender representation in the visual and literary arts. The salon conversation – designed and conceptualized by Bellevue Salons – will be part of the educational outreach programming for Pages of a Mind: Raja Ravi Varma at Piramal Art Museum, Mumbai. One of Raja Ravi Varma’s enduring, and contestable, legacies is the nature of his looking at, and representing, the Indian woman in his paintings. She is most often demure, passive and idealized in a way that the men are not. If ever she is active, it is almost always in a manner of whimsy, her sexual or seductive nature amplified. She is seldom realistically represented as an imperfect body, but always ornamented, made-up and forced to impress upon an unknowable audience. Of course, this mode of representation was not novel, but a hereditary form of western painting, the classical tradition in which the Master was adequately trained. The history of idealization of women in western painting has often been canonized within the politics of the male gaze, of representing woman not as she is, but as she should be seen through the filtering lens of male pleasure. Such a dynamic has an inherent power asymmetry with an assumed gender hierarchy, which was not personal to the artist, but instead reflected the nature of his social milieu ensconced within a larger program of entwined patriarchy and nationhood. Over the past century, culture theorists, including most notably feminist and queer thinkers, have deconstructed and complicated the male gaze to align with shifting cultural politics and national agendas – at least in the western sphere. How closely can we, as Indians, relate to Raja Ravi Varma’s female iconographies in contemporary times? Has the nature of representation changed, or are we still confronted by the same oppressive dogmas, albeit in contemporary form? Rosalyn and Sharmistha seek to debate and discuss the relevance of body politics and gender constructs in our times. The evening moves on to a delightful and intense performance of Sangeet Bari, a Lavani song and dance performance by female performers in the traditional style from Pune that explores the bold sexuality of this traditional, folk style. This critically acclaimed theatre production that combines multiple dramatised anecdotes about the traditional artists along with live Lavani performances that leave the audience spellbound. Lavani, a cultural product of Maharashtra with a rich centuries-old heritage originating within matriarchal nomadic tribes, has progressed with the times, even while it struggles for survival. The contemporized form presented here identifies the tradition in which women were represented for the gaze of the patron, naturally a wealthy upper-caste male – and seeks to reclaim the female narrative while still using the traditional format of sexually charged lyrics and body movements. This performance will engage with two key themes of the evening: how women’s sexuality is expressed through the lens of a form that was written by men for the entertainment of men, and the female performer’s experience of viewing one’s own body as a performative object outside of the strict, sanitised norms of society. The incredible life stories of the female performers shed light on this indigenous dance form and inspired the critically acclaimed book Sangeet Bari in Marathi, published by Rajhans Prakashan in 2014. The film and the book both focus on the lives of these women, portraying them as artists and protagonists in their own right, rather than as seductresses or victims as conveyed through popular culture. The performance will feature Sangeet Natak Akademi Award winning artist Shakuntalabai Nagarkar along with Sunita Dhondraikar, and is written by Bhushan Korgaonkar, with direction by Savitri Medhatul.